Bioengineering is a broad-based engineering discipline that applies engineering principles and design to challenges in human health and medicine, dealing with bio-molecular and molecular processes, product design, sustainability and analysis of biological systems. Applications that benefit from bioengineering include medical devices, diagnostic equipment and biocompatible materials, amongst others. 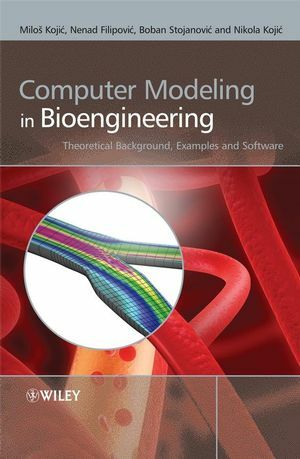 Computer Modeling in Bioengineering includes computational methods for modelling bones, tissues, muscles, cardiovascular components, cartilage, cells and cancer nanotechnology as well as many other applications. It bridges the gap between engineering, biology and medicine, and will appeal not only to bioengineering students, lecturers and researchers, but also medical students and clinical researchers. Milos Kojic is professor of mechanical engineering, University of Kragujevac, Serbia; and Senior Research Scientist, Harvard School of Public Health, Harvard University, Boston. He is one of the leading scientists in computational mechanics. He has published, as the author or mainly the first author, around 60 journal papers, among which are papers in leading international journals, as International Journal for Numerical Methods in Engineering, Computer Methods in Applied Mechanics and Engineering, Comp. Mech., International Journal of Vehicle Design, Appl. Mech., Computers and Struct, Biophysical Journal, Phys. Rev., etc. His research spans from the finite element method in general, methods of inelastic analysis of solids and structures, field and coupled problems, to biomechanics, and recently molecular dynamics and discrete particle methods. Nenad Filipovic is associate professor of mechanical engineering, University of Kragujevac,? Serbia; and research associate at Harvard School of Public Health, Harvard University, Boston. He is young scientist and author and co-author of a number of papers in international journals. Boban Stojanovic is a Ph.D. candidate in Bioengineering at Multidisciplinary Graduate Studies of University of Kragujevac. He received his B.S. at Faculty of Mechanical Engineering of University of Kragujevac, as first in his generation and most talented students. During his studies he participated significantly in development of the finite element program PAK. Nikola Kojic is a Ph.D. candidate in the Harvard-MIT Division of Health Sciences and Technology. He received his M.S. in Mechanical Engineering in 2003 from MIT, working on synthetic and natural spider silk. Specifically, his focus was on the application of computational models to synthetic and natural spider silk fiber spinning. 1. Notation - Matrices and Tensors. Computer Modeling in Bioengineering Visit the authors' website for; further discussion on the theory outlined in the book; more detailed examples; additional examples; access to the software examples and tutorial examples.